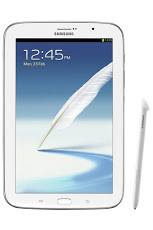 Samsung is about to throw in another tablet to the mix, the Galaxy Note 8.0. The device is neatly positioned to start to offer Samsung users a range of devices that vary merely in their size and unlike the Apple world these in the main offer the same or similar functionality without the defined walls created by Apple. In other words you have the Galaxy phone with pen, the Note II, 7 & 8 with pen all with the same SIM size and all capable of being tethered or being a phone. Apple like to separate their media light device iPod, from their phone, Iphone from the Tablet, iPad. The point is that all mobile devices are converging in technology and are all underpinned by a common platform but separating in how we use them. Do we want different devices to do different things or do we want all devices to inherently offer the same but vary in their form and footprint? We may want a basic phone tethered to a sophisticated larger form tablet / server. We may want this reversed so we have the smaller footprint on the go with the option to tether the tablet when required. The world is not about having devices that perform X or Y but a mobile platform that offers choices and interoperability. It is not hard to envisage a mobile server which is ‘connected’ to slave mobile devices, each with its own specialised usage and with a common set of functionality. This year we shall see the ‘glasses’ and the wrist ‘watch’ and we already have the earpiece. Ask yourselves what the difference really is between ASUS, Acer, HP, Dell, Samsung, laptops? Then what is the difference between these and a Mac? Maybe it is down to Android versus IOS and for some that may be Déjà vu. Hello, I love reading through your blog, I wanted to leave a little comment to support you and wish you a good continuation. So What Does LG know that the rest of us don’t? So What Does Nook Want To be When It Grows Up? What determines the device and format of music? Should We Condemn DRM to Room 101? Is The BBC Losing Its Way?